By Wade Smith, Executive Director, Air Movement and Control Association (AMCA). “How come the amp-draw of the fan drops when the filters are dirty?” Al Veeck asked me one December evening after a long meeting with HVAC industry association executives. Of course, he knew his question was a form of flattery, and that I would enjoy sharing my insights. What followed was a running banter interrupted by traffic, Christmas carols on the radio, and a 20 minute break to refresh before dinner. This discussion went on for hours – all good and I have no doubt that Al is now a fan expert. Sadly, his next request came by e-mail. “Would you write an article on this – just cover what we discussed last night.” Now he was really feeding my ego – how could I possibly say “no”? As it turns out, the American fan industry is about 120 years old – and during that time the industry has fragmented to support 135 companies selling into the American market. Designs continue to proliferate, and differentiate suppliers who search for a niche where they can drive costs down, and value up for their customers. Happily, we can get by referring to two basic fan forms. The one you are most familiar with is a forward curved fan, which employs small forward cupped blades at the periphery of the fan impeller. Forward Curved fans (often called FC fans for short) are relatively inexpensive to manufacture, so naturally they are popular in systems up to 100 tons or so (35,000 cfm), including your bathroom exhaust fan (30 cfm) and a residential furnace (1,000 cfm). The FC fan is a good choice for low to medium pressure (under 4”) applications, and lower flow rates. Sure enough, as Al commented, an FC fan actually uses less power as system pressure increases. 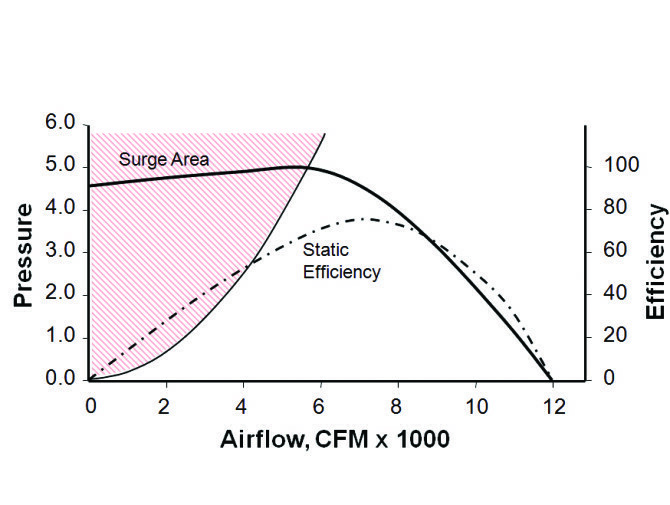 This is because the FC fan energy use is linked to flow rates more than pressure differential. As the system resistance increases (filters get dirty), flow decreases, and because flow decreases, power decreases. If that were the end of the story, one would think – dirty filters are good – they improve fan efficiency. And that is certainly true. Unfortunately, the FC fan was sized so that the cooling (or heating) system was as efficient OVERALL as possible. Reducing airflow compromises the A/C or heating system, delivering fewer BTU’s because airflow is reduced, wasting more energy up the chimney, or at the compressor. Lower airflow is NOT a good thing, but it does indeed reduce FC fan energy use. Larger commercial and industrial systems (20,000 cfm and up, at differential pressures of 3” plus) often employ a more efficient, heavier, more expensive backward inclined fan. This fan has long blades tilted backward relative to the wheel rotation. Blades are often airfoil shaped. Inlet housings and backplates are aerodynamically shaped to minimize turbulence. For the same flow rate and pressure, a BI fan is larger, much heavier (welded construction), more efficient and faster rotating. Folks choose this fan to reduce energy, and because this fan is sometimes referred to as a “non-overloading” fan. You see, unlike the FC fan, BI fans do NOT change their power draw as system pressure differentials change. Of course, we talked earlier about the power benefit of loading up an FC fan – the downside is that if you reduce system pressure on an FC fan, it moves more air, and consumes more power. Leave the filters out, and you may burn up the motor. Not so with a BI fan. BI fan airflows vary with increased system pressure, but power does not. If you’re an engineer designing a system, and you are not really sure what the system pressure will be, a BI fan looks like a good choice. And it’s more efficient. All inefficiency (losses of shaft power turned to heat) inside a fan is due to turbulence. So is noise. A fan creates a pretty dynamic change in air movement. Think about how you would be jerked around if you were sitting on an air molecule running through a fan. Of course, an FC fan is designed to be inexpensive to manufacture, so there are lots of aerodynamic compromises made to keep manufacturing simple and quick. A BI fan is quite different. It weighs more than twice as much, so the design goals for this fan are different. It’s going to cost a LOT more, so it better be good (meaning, it better be aerodynamic). Look closely at a BI fan sometime (stick your head inside) and note the smooth transition from inlet to outlet. Now look at an FC wheel – heck, the first 3 inches of the fan blade are clearly going to be starved for air. That means this area of the fan wheel is being sucked dry of air molecules. What happens in a vacuum? Some source will rush to fill it – in this case from the leaving side of the wheel. Yup, air flows backwards through the FC wheel near the fan inlet. Backwards flow – not a good thing. Technically, this is called “surge”. And an FC fan is in surge all the time. When you increase system pressure, you decrease flow, and the length of the surge area on the FC fan grows across the wheel width. This is why FC fans have a characteristic low frequency rumble, especially at medium pressures. And this is why FC fans don’t perform well at higher pressures. Turbulence = energy lost to heat = noise. Not that BI fans are all that wonderful. They work smooth and clean right up until they don’t. If the flow is too low, and the pressure too high, the system can push a BI fan into surge as well. Unlike the FC fan where surge is a continuous and growing phenomena as pressure rises, a BI fan has no surge under normal conditions — until you pass the “surge line” (see fan curve below). When you put a BI fan into surge, all hell breaks lose all at once. It sounds like a bull elephant in heat. Then it ends abruptly un til discharge pressure builds again, and surge happens again. The fan shakes, breaks, and rattles the building structure. Very ugly. Of course, VAV came along about 40 years ago, and the fan industry has been miserable ever since. Now the system is DESIGNED to change. Ugh. VAV box dampers close near the occupied space as their thermostats become satisfied. Pressure in the duct rises. If the fan were not throttled back, we’d blow up the ductwork, but not before we run that old leak detection mode (look for the whistles). So, early VAV systems employed dampers at the fan to throttle capacity, controlled to maintain a maximum duct pressure somewhere convenient downstream. FC fans used discharge dampers, because as we learned, FC fans consume much less power. And deliver much less air when you simple raise the fan differential pressure. This approach doesn’t deliver fan energy savings in BI fans, so inlet vanes were used. Inlet vanes literally spin the air entering the fan wheel, in the same direction that the wheel is spinning. So, the relative speed of the fan wheel to the spinning air is reduced. It’s just like slowing down the fan wheel. Naturally, if you slow the fan’s speed, it delivers less air, and uses less power. Of course, you added the inlet vane pressure drop (and turbulence), but it works. As it turns out, there is no better way to control a fan’s capacity than to vary its speed. Take the inlet vanes and discharge dampers away, and just slow the fan down. No damper induced turbulence. Less risk of objectionable surge. And well behaved mathematics. Turns out, airflow varies directly with speed. Half speed = half airflow. Pretty nifty. But it gets better. Pressure varies with the square of speed (or the square of the change in airflow). So, all else being equal, a fan running at half speed will generate half the airflow, and ¼ the system resistance to flow. For all you filter geeks, this must be pretty useful. But now for the “coup de gra”. It turns out that power varies with the cube of the speed change. So, half speed, gives us half the airflow, but 1/8 the power. WOW. As it turns out, fans run pretty much all the time, so they consume 30% to 40% of commercial HVAC system energy. They may be only 10% of the connected load, but hey – if there are folks in the building, the fan is going to run to ventilate the space. Yup – naturally fans are getting more efficient. FC fans are starting to appear with a larger inlet cone, and curved front ring. BI fans are more frequently sporting airfoil shaped blades (they have the profile of an airplane wing). And system designers are more likely than ever to choose a larger more efficient fan. Did you get that? A larger, more efficient fan. That’s right. The larger the fan, the slower it turns, and the less turbulence (reduced by a factor of 8) there is, so less power, less noise, more green. And bigger fans. But the most exciting change is all about controlling fan speeds. Electrically commutated, permanent magnet motors are 15% to 20% more efficient at the fan’s full speed design point (that’s good), but they have no synchronous speed. Which is to say, that their controls can run the motor at nearly any speed. This technology is cost effective up to around 30 horsepower, with an overlap down to 5 hp of other technologies in the works to much larger sizes. Plus there is the old stand-by (variable frequency drives) in any capacity, literally. So, if you were a system designer, and fans were drawing 40% of the energy, you’d think a bit about how variable speed might be exploited. In residential systems, fan speeds are varied to near “0” to keep ventilation rates and controls responsive. The winning strategy is the vary the speed of everything – the fan, the compressor, and the gas fire rate – all at the same time to meet the load. This is VAV in a one-zone system. Why not? Al and I are old farts – will probably retire long before variable speed is becomes the requirement on everything we touch. But you whipper-snappers who skipped third semester calculus will need to think this through. What are the implications of variable speed fan systems? A loaded filter system may not put a fan in surge if it’s running at constant speed – but how about when its running slowly? Will the newer systems benefit more from continuous monitoring of fan (airflow, pressure and power) and filter (pressure drop) with wireless remote data uploads to the cloud every minute? What about sensing of indoor air quality (CO-2) and control of ventilation rates using variable speed – what are the implications to your filter system. By the way, if you have three filter banks in series, with an intent to change the pre-filters often, why is the fan selected based on the maximum load of all three filter banks (which can never happen)? What about filtering CO-2 from the return air, and reducing outside airflows further? (Maybe you can earn carbon sequestering credits). Forget it. I used this headline “system effects” only to illustrate one point. There is a lot I have not told you here. Like why the fan refuses to perform in the field as the catalog describes. Or the detrimental effects of system leakage, and how to make leakage go away. How about axial flow fans, and mixed flow fans, or radial bladed fans (like the one in your vacuum cleaner). Lots of answers are available on the AMCA web site – feel free. They say that the sign of en educated person, is when they realize how little they know. So, I leave you now in the hope that you enjoyed this little ego burst of mine, and may now think more creatively about how filters and fans affect each other in ways that create business opportunity for you – and with a confidence that you are indeed and educated person with respect to fans. Warmest Wishes to you, this holiday season.